UK Chancellor George Osborne believes the SNP "are tying themselves in knots" over plans to retain the pound in the event of a yes to independence. He insisted that a currency union could only work as part of a political and economic union. Scotland's SNP government wishes to maintain sterling in the event of a yes vote in next September's referendum. Deputy First Minister Nicola Sturgeon said keeping the pound was the "common sense position supported by the facts". However, in a UK government article published on the HM Treasury website, Mr Osborne and his Treasury chief secretary, Danny Alexander, said the Nationalist plan "did not add up". They write: "The conclusion is clear. The pound we share now works and it works well. Under independence all the alternatives are second best. So our question to the Nationalists - are you really saying second best is good enough for Scotland?" The opinion comes ahead of the publication on Tuesday of the UK government's analysis of the implications for the currency of Scottish independence. The electorate in Scotland will vote on whether it should become an independent nation. The poll will take place on Thursday, 18 September, 2014. Voters will be asked a single yes/no question: "Should Scotland be an independent country?" 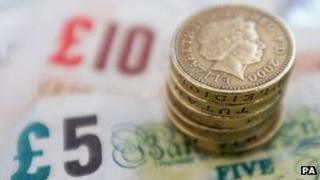 The Scottish government has set out plans to retain the pound as part of a "sterling zone" with the rest of the UK. Economics experts in the Fiscal Commission Working Group, set up by First Minister Alex Salmond, have already concluded keeping sterling as the currency in an independent Scotland was "sensible" and an attractive choice for the rest of the UK. The article by the two Treasury politicians stated: "This isn't a question of whether or not Scotland could go it alone - of course Scotland could. "The real question is whether going it alone is the best way for people living in Scotland to realise their aspirations and provide security for themselves and their family. "We hope very much that people living in Scotland will decide to stay. The United Kingdom has done so much together and can achieve so much more in the future." It added: "So, if Scotland does vote Yes on 18th September 2014, they [SNP] say they want to hand, to what would become a foreign government, key decisions over the Scottish economy. "This is one of the big contradictions in their whole economic approach. Campaigning to 'bring powers home' with one hand, while giving them away with the other. Calling for 'full fiscal freedom' with one breath, but calling for a 'full fiscal pact' with the next. It simply doesn't add up." The senior UK government figures said the UK was a "deeply integrated" single domestic market with a large percentage of Scottish exports being done with the rest of the UK and thousands of people working for the same companies across borders. But Scottish government minister Ms Sturgeon said that an independent Scotland using the pound would mean sterling's balance of payments would be "massively boosted by Scotland's huge assets, including North Sea oil and gas - which alone swelled the UK's balance of payments by £40bn in 2011-12". She added: "At present, the Scottish Parliament controls just 7% of Scotland's revenue base, and that would only increase to 15% under the terms of the Scotland Act. "With independence, Scotland will control 100% of our revenues, which is what it needs to be able to build a stronger economy and fairer society. "The combination - which only comes with independence - of keeping the pound, accessing Scotland's abundant resources, and taking decisions on tax and other economic policies that are right for Scotland, is the best way to boost jobs and growth."